Leading UK clock conservation specialist, Matthew Read, discusses the live-streaming of repairs to Big Ben and material memory ahead of this year's George Daniels Lecture. 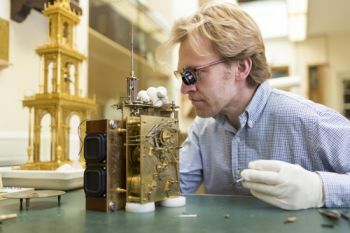 On 30th November, Matthew Read (MA, ACR), Clock Conservation programme leader at West Dean College, will deliver the fourth George Daniels Lecture at City, University of London, titled, "Conservation, Craft and Clockmaking". 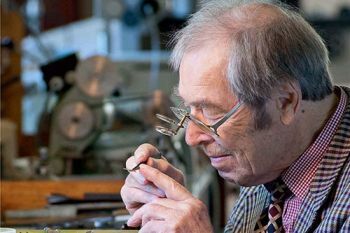 George Daniels CBE, DSc, FBHI, FSA (19th August 1926 to 21st October 2011) created the co-axial escapement, one of the most significant developments in watchmaking for the last 250 years and which has since been licensed to Omega. He studied horology at City’s predecessor, the Northampton Institute. After his death, the George Daniels Educational Trust administered the substantial funds he bequeathed to provide scholarships for City’s students and to benefit research in measurement and instrumentation at the University. Currently, George Daniels' substantial financial endowment supports the following within the School of Mathematics, Computer Science and Engineering: the George Daniels Chair in Scientific Instrumentation; the George Daniels Lecturer in Scientific Instrumentation; fifteen Undergraduate Scholars studying for degrees in Biomedical, Mechanical, Civil, Aeronautical Engineering and Mathematical Sciences; and three PhD studentships. Matthew Read spoke to City News about his work and the craft of conservation. City News: What do you teach at West Dean College? Matthew Read: Clock making and approaches to, and the treatment of dynamic historic objects. This includes bench craft, preventative conservation, moving and handling, technical drawing, use of machine tools, historic craft practice. I teach from Foundation Degree to Masters. CN: What is a clock conservator? 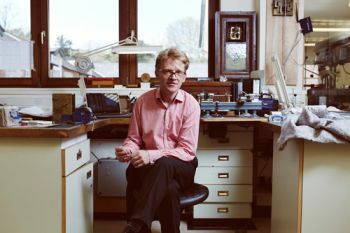 MR: A clock conservator is generally a craft practitioner who adopts conservative practice throughout their work. Conservative practice is defined by a number of internationally recognised conservation organisations such as the Institute of Conservation (ICON). The conservator may draw on the worlds of science and analysis, curatorship and interpretation and the history of science, craft and horology among others to inspire, substantiate, support and inform their work. CN: Will the live-streaming of repairs to Big Ben bring more public attention to clock making or will it appeal to just the scientifically minded? MR: Clock making in the traditional sense is very niche and of course the restoration or overhaul of Big Ben will be of interest to enthusiasts. The use and leveraging of social media and other more mainstream communication tools is very healthy. Here at West Dean College we are actively trying to reach specialist and non-specialist audiences and a West Dean alumni is part of the Big Ben team. CN: Is clock restoration and conservation an art or a science? MR: It is primarily a craft. It is increasingly supported and informed by science. Aesthetics, form and function play an important role in new making and object interpretation but as a conservator there is no art intent. CN: How did you get into this fascinating field of work? MR: Through our third generation retail jewellery family business which is still owned and run by my brother, a gemmologist. I had my first exposure to conservation working at the Royal Observatory, Greenwich as an assistant to Curator Jonathan Betts. CN: How important is clock making and the conservation of clocks in the digital age? MR: In one sense, not at all important. It depends on your view of life, the value of humanity and craft within that. Conservators refer to historic objects as Cultural Property. I prefer to think of them as material memory. Rather like loss of actual memory, as a human being, takes away much or all we have. Loss of material memory deprives humanity. That is why I feel conservation is important. As far as new making is concerned, creativity and our link with tools, materials and manufacture is for me an essential ingredient of life. I try to take a holistic view and mechanical clocks; electronic, electro-mechanical and digital are all part of a continuum. CN: Are there sufficient programmes of study in the UK to satisfy interests in horology and clock making? Is UK clock making in good enough nick? MR: The watch industry is relatively well serviced in terms of education within the UK. It could be argued that clock making has become somewhat a poor cousin. There is hope and given further cooperation, alignment and strategy, current clocks education providers could engender a brighter future for clock making. An ICON Dynamic Objects network has just been formed which is a very positive step towards the professional recognition of clock making within conservation. CN: What were the highlights of your stint at the National Maritime Museum in Greenwich? MR: Meeting some great and inspiring craftspeople including Derek Pratt, Roger Stevenson and George Daniels. To attend the George Daniels Lecture, please register using this weblink. The conservation/restoration of cultural heritage focuses on protection and care of tangible cultural heritage, including artworks, architecture, archaeology, and museum collections. Conservation activities include preventive conservation, examination, documentation, research, treatment, and education. This field is closely allied with conservation science, curators and registrars.